The device affects muscles in the region of application of the electrode with a unique electric signal. No similar device can replicate this signal. The device’s signal generates the same type of signal that human brain sends muscles to make them contract. Therefore, the device does not cause a "conflict of muscle layers", because muscles work as a single system. Another important feature of the device is in the depth of effect: the device not only affects the surface muscle layer and the muscles under the electrode, but it forces the contraction of all muscles, to the total depth and with maximum intensity. Deep contractions improve muscle tone in a specific area and can even be used to animate the muscles that have begun to atrophy. All other devices of this kind provoke muscle wasting. 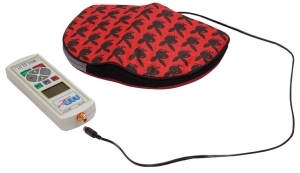 The Markelov Stimulator is the only device that takes into consideration the ability of the human body to accumulate an electric charge, adjusting and forming a unique signal shape, which allows for deep muscle penetration. How do other myostimulators work? Most myostimulators use electric signals as a stimulus to affect biologically active points, which are responsible for certain areas of the human body or organs. It has been proved that prolonged use of ordinary myostimulators exhaust muscles. That’s why a number of European countries imposed a ban on the use of myostimulyators in medical practice. Due to the use of simple pulse shapes and the absence of options to change the modes of phasemodulation and frequency, and also because of the low power of devices, the signals produced by most myostimulators are too shallow and short, so they cannot affect deeper-set muscles. All devices of this type have a built-in current generator (transformer). In practical terms, this means that the connection for each successive pair of electrodes reduces the total power of such device. Most of these devices do not have specialized professional treatment programs and programs usuallyinclude such simple modes as “tone”, “relaxation” and “sport”. Most myostimulators are powered only from a mains electric outlet, so you can only use them indoors. • A unique deep penetration signal, replicating the shape of the natural signals produced by a human brain. • The device tones muscles and eliminates their weakness. • The simulator produces a powerful effect even on deeper-set muscle layers. • The device is small in size, similar to a couple of 180x60x27mm smartphones, so you can easily take itwith you on any vacation or business trip. • The device has a set of built-in exclusive programs designed to treat specific diseases. • The device can be powered by regular or rechargeable batteries. • It can be used in any environment which is comfortable for you (e.g. at home), without a doctor! • Rapid effect after just 3 massages. • Massage without pain and discomfort. • Removes and eliminates the source of pain. • Strengthens blood vessels and improves their structure. The use of the stimulator.